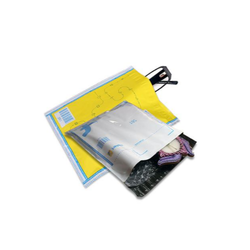 Our range of products include messenger envelopes, packing envelopes, reclosable packing list envelope, single use packing list envelopes and document envelopes. 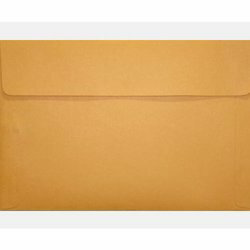 Our esteemed customers can buy a wide range of Messenger Envelopes from us. Our experts use superior grade sixty-micron co-extruded polyethene film to manufacture these envelopes. Our range is the safest medium for emailing sensitive documents. 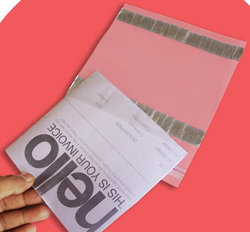 Our organization manufactures and supplies a variegated range of Packing Envelopes. We craft these packing envelopes from high quality clear polyethylene with adhesive covered by a liner on the rear of forty micron. Our range is widely used in packaging light weight goods and documents. A4 - 3fold 5.90 x 4.75. 1"
A4 - 2fold 9.25 x 6.70 1"
Invoice 9.85 x 6.70 1"
A4 12.2 x 8.25 1"
It becomes difficult to recollect about which carton/box contains what! We provide you a convenient way to recognize and resolve this issue. 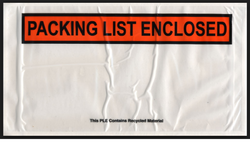 Single Use Packing List Envelopes: These adhesive holders are attached/adhered to container surface allowing for waybill, consignment notes etc. to be inserted. The width of these envelopes is kept ideal to make sure that important document can be inserted easily. Our offered document envelopes are made from high quality bio degradable material, which is sourced from trusted and reliable market vendors.